The discrete logarithm problem based on elliptic and hyperelliptic curves has gained a lot of popularity as a cryptographic primitive. The main reason is that no subexponential algorithm for computing discrete logarithms on small genus curves is currently available, except in very special cases. Therefore curve-based cryptosystems require much smaller key sizes than RSA to attain the same security level. This makes them particularly attractive for implementations on memory-restricted devices like smart cards and in high-security applications. 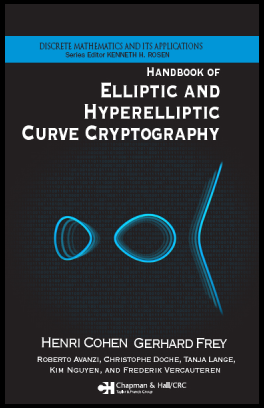 The Handbook of Elliptic and Hyperelliptic Curve Cryptography introduces the theory and algorithms involved in curve-based cryptography. After a very detailed exposition of the mathematical background, it provides ready-to-implement algorithms for the group operations and computation of pairings. It explores methods for point counting and constructing curves with the complex multiplication method and provides the algorithms in an explicit manner. It also surveys generic methods to compute discrete logarithms and details index calculus methods for hyperelliptic curves. For some special curves the discrete logarithm problem can be transferred to an easier one; the consequences are explained and suggestions for good choices are given. The authors present applications to protocols for discrete- logarithm-based systems (including bilinear structures) and explain the use of elliptic and hyperelliptic curves in factorization and primality proving. Two chapters on smart cards explore their design and efficient implementations. Practical and theoretical aspects of side-channel attacks and countermeasures and a chapter devoted to (pseudo-)random number generation round off the exposition. The broad coverage of all important areas makes this book a complete handbook of elliptic and hyperelliptic curve cryptography and an invaluable reference to anyone interested in this exciting field. All chapters are listed here. For a complete Table of Contents see the section Sample Chapter. Roberto M. Avanzi is currently Junior Professor at the Ruhr-University, Bochum. His research interests include arithmetic and algorithmic aspects of curve-based cryptography, integer recodings and addition chains, side-channel analysis, and Diophantine analysis. Henri Cohen is Professor of Mathematics at the University of Bordeaux, France. His research interests are number theory in general, and computational number theory in particular. Christophe Doche is lecturer at Macquarie University, Sydney, Australia. His research is focused on analytic and algorithmic number theory as well as cryptography. Gerhard Frey holds a chair for number theory at the Institute for Experimental Mathematics at the University of Duisburg-Essen, Germany. His research interests are number theory and arithmetical geometry as well as applications to coding theory and cryptography. Tanja Lange is Professor at Eindhoven Technical University. Her research covers mathematical aspects of public-key cryptography and computational number theory with focus on curve cryptography. Kim Nguyen received a Ph.D. in number theory and cryptography in 2001 at the University of Essen. His first position outside academia was with the Cryptology Competence Center of Philips Semiconductors Hamburg. He currently works for the Bundesdruckerei GmbH in Berlin, Germany. Frederik Vercauteren is a Post-Doc at the Katholieke Universiteit Leuven, Belgium. His research interests are computational algebraic geometry and number theory, with applications to cryptography. We are glad to provide access to one sample chapter. With permission of CRC you may view (but not save or print) the following table of contents, chapter and bibliography. The standard copyright notice from CRC Press applies to this electronic version. The first page of each file contains the full statement. Short table of contents. The full version can be found in section Sample Chapter. MAA Online July 2006 by Fernando Q. Gouvêa. European Mathematical Society short review as recent book pp. 56-57. Zentralblatt MATH by Juan Tena Ayuso, ZBL 1082.94001. Mathematical Reviews by Steven D. Galbraith, MR 2162716. A cached pdf-file. mathematik.deRezension von Florian Hess im Computeralgebra-Rundbrief in Nr. 40 - März 2007.